The 1947–49 Palestine war[a], known in Hebrew as the War of Independence (Hebrew: מלחמת העצמאות‎, Milkhemet Ha'Atzma'ut) or the War of Liberation (Hebrew: מלחמת השחרור‎, Milkhemet HaShikhrur) and in Arabic as The Nakba or Catastrophe (Arabic: النكبة‎, al-Nakba), refers to the war that occurred in the former Mandatory Palestine during the period between the United Nations vote on the partition plan on November 30, 1947, and the official end of the first Arab–Israeli war on July 20, 1949. The 1947–48 Civil War in Mandatory Palestine (sometimes called an "intercommunal war") in which the Jewish and Arab communities of Mandatory Palestine supported by the Arab Liberation Army, clashed while the region was still fully under British rule. The 1948 Arab–Israeli War after 15 May 1948, marking the end of the British Mandate and the birth of Israel, in which Transjordan, Egypt, Syria and Iraq intervened in sending expeditionary forces that entered former British Palestine and engaged the Israeli forces. At the end of the war, the State of Israel kept the area that had been recommended by the UN General Assembly Resolution 181 as well as almost 60% of the area allocated to the proposed Arab state, including the Jaffa, Lydda and Ramle area, Galilee, some parts of the Negev, a wide strip along the Tel Aviv–Jerusalem road, and some territories abutting the area that would become the West Bank, putting them under military rule. Transjordan took control of most of the remainder of the Palestinian mandate, which it annexed and renamed the West Bank, while the Egyptian military took control of the Gaza Strip. With Jordan occupying the West Bank and Egypt occupying Gaza, no state was created for the Palestinian Arabs. Dramatic demographic changes accompanied the war in the country. Around 700,000 Palestinian Arabs fled or were expelled out of 900,000 from the area that became Israel, and they became Palestinian refugees. Due to the war, around 10,000 Jews fled or were expelled from their homes in Palestine. In the three years following the war, about 700,000 Jews fled from Europe and Arab lands and immigrated to Israel, with one third of them having left or been expelled from their previous countries of residence in the Middle East. These Jewish refugees were absorbed into Israel in the One Million Plan. Fawzi al-Qawuqji's (3rd from the right) in 1936. In 1946, David Ben-Gurion decided that the Yishuv would probably have to defend itself against both the Palestinian Arabs and neighbouring Arab states and accordingly began a "massive, covert arms acquisition campaign in the West", and acquired many more during the first few months of hostilities. The Yishuv managed to clandestinely amass arms and military equipment abroad for transfer to Palestine once the British blockade was lifted. In the United States, Yishuv agents purchased three B-17 bombers, one of which bombed Cairo in July 1948, some C-46 transport planes, and dozens of half-tracks, which were repainted and defined as "agricultural equipment". In Western Europe, Haganah agents amassed fifty 65mm French mountain guns, twelve 120mm mortars, ten H-35 light tanks, and a large number of half-tracks. By mid-May or thereabouts, the Yishuv had purchased from Czechoslovakia 25 Avia S-199 fighters (an inferior version of the Messerschmitt ME-109), 200 heavy machine guns, 5,021 light machine guns, 24,500 rifles, and 52 million rounds of ammunition, enough to equip all units, but short of heavy arms. The airborne arms smuggling missions from Czechoslovakia were codenamed Operation Balak. Schwimmer's operation also included recruiting and training fighter pilots such as Lou Lenart, commander of the first Israeli air assault against the Arabs. On 29 November 1947, the United Nations General Assembly adopted a resolution "recommending to the United Kingdom, as the mandatory Power for Palestine, and to all other Members of the United Nations the adoption and implementation, with regard to the future government of Palestine, of the Plan of Partition with Economic Union", UN General Assembly Resolution 181(II). This was an attempt to resolve the Arab-Jewish conflict by partitioning Palestine into "Independent Arab and Jewish States and the Special International Regime for the City of Jerusalem". Each state would comprise three major sections; the Arab state would also have an enclave at Jaffa in order to have a port on the Mediterranean. With about 32% of the population, the Jews were allocated 56% of the territory. It contained 499,000 Jews and 438,000 Arabs and a majority of it was in the Negev desert. The Palestinian Arabs were allocated 42% of the land, which had a population of 818,000 Palestinian Arabs and 10,000 Jews. In consideration of its religious significance, the Jerusalem area, including Bethlehem, with 100,000 Jews and an equal number of Palestinian Arabs, was to become a Corpus Separatum, to be administered by the UN. The Jewish leadership accepted the partition plan as "the indispensable minimum," glad to gain international recognition but sorry that they did not receive more. The representatives of the Palestinian Arabs and the Arab League firmly opposed the UN action and rejected its authority in the matter, arguing that the partition plan was unfair to the Arabs because of population balance at that time. The Arabs rejected the partition, not because it was supposedly unfair, but because any form of partition was rejected by the Arabs' leaders. They upheld "that the rule of Palestine should revert to its inhabitants, in accordance with the provisions of [...] the Charter of the United Nations." According to Article 73b of the Charter, the UN should develop self-government of the peoples in a territory under its administration. In the immediate aftermath of the UN's approval of the partition plan, explosions of joy amongst the Jewish community were counterbalanced by the expression of discontent amongst the Arab community. Soon after, violence broke out and became more prevalent. Murders, reprisals, and counter-reprisals came fast upon each other, resulting in dozens of victims killed on both sides. The sanguinary impasse persisted as no force intervened to put a stop to the escalating violence. This period constitutes the first phase of the war, which took place following the United Nations General Assembly vote for the Partition Plan for Palestine on 29 November 1947, until the termination of the British Mandate and Israeli proclamation of statehood on 14 May 1948. During this period the Jewish and Arab communities of British Mandate clashed, while the British organized their withdrawal and intervened only on an occasional basis. In the first two months of the Civil War, around 1,000 people were killed and 2,000 people injured, and by the end of March, the figure had risen to 2,000 dead and 4,000 wounded. These figures correspond to an average of more than 100 deaths and 200 casualties per week in a population of 2,000,000. 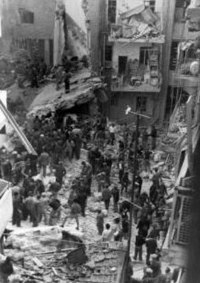 Aftermath of the car bomb attack on the Ben Yehuda St., which killed 53 and injured many more. From January onwards, operations became increasingly militarized. A number of Arab Liberation Army regiments infiltrated into Palestine, each active in a variety of distinct sectors around the different coastal towns. They consolidated their presence in Galilee and Samaria. The Army of the Holy War, under the command of Abd al-Qadir al-Husayni, came from Egypt with several hundred men. Having recruited a few thousand volunteers, al-Husayni organised the blockade of the 100,000 Jewish residents of Jerusalem. To counter this, the Yishuv authorities tried to supply the city with convoys of up to 100 armoured vehicles, but the operation became more and more impractical as the number of casualties in the relief convoys surged. By March, al-Husayni's tactic had paid off. Almost all of Haganah's armoured vehicles had been destroyed, the blockade was in full operation, and hundreds of Haganah members who had tried to bring supplies into the city were killed. The situation for those who dwelt in the Jewish settlements in the highly isolated Negev and North of Galilee was more critical. This situation caused the US to withdraw their support for the Partition plan, and the Arab League began to believe that the Palestinian Arabs, reinforced by the Arab Liberation Army, could put an end to partition. The British decided on 7 February 1948 to support the annexation of the Arab part of Palestine by Transjordan. While the Jewish population was ordered to hold their ground everywhere at all costs, the Arab population was disrupted by the general conditions of insecurity to which the country was exposed. Up to 100,000 Arabs, from the urban upper and middle classes in Haifa, Jaffa and Jerusalem, or Jewish-dominated areas, evacuated abroad or to Arab centers to the east. Ben-Gurion ordered Yigal Yadin to plan in preparation for the announced intervention of the Arab states. The result of his analysis was Plan Dalet, which was put in place from the start of April onwards. An Arab road block, at the main road to Jerusalem. The adoption of Plan Dalet marked the second stage of the war, in which Haganah took the offensive. The first operation, named Nachshon, was directed at lifting the blockade on Jerusalem. In the last week of March, 136 supply trucks had tried to reach Jerusalem; only 41 had made it. The Arab attacks on communications and roads had intensified. The failure of the convoys and the loss of Jewish armoured vehicles had shaken the Yishuv leaders' confidence. 1500 men from Haganah's Givati brigade and Palmach's Harel brigade conducted sorties to free up the route to the city between 5 April and 20 April. The operation was successful, and enough foodstuffs to last 2 months were trucked into Jerusalem for distribution to the Jewish population. The success of the operation was assisted by the death of al-Husayni in combat. During this time, and independently of Haganah or the framework of Plan Dalet, irregular troops from Irgun and Lehi formations massacred 107 Arabs at Deir Yassin. The event that was publicly deplored and criticized by the principal Jewish authorities had a deep effect on the morale of the Arab population. At the same time, the first large-scale operation of the Arab Liberation Army ended in a "débâcle", as they were roundly defeated at Mishmar HaEmek. Their Druze allies left them through defection. Within the framework of creating Jewish territorial continuity according to Plan Dalet, the forces of Haganah, Palmach and Irgun intended to conquer mixed zones of population. Tiberias, Haifa, Safed, Beisan, and Jaffa were taken prior to the end of the Mandate, with Acre falling shortly after. More than 250,000 Palestinian Arabs fled from these locales. The British had essentially withdrawn their troops. The situation pushed the leaders of the neighboring Arab states to intervene, but their preparation was not completed, and they could not assemble sufficient forces to turn the tide of the war. The majority of Palestinian Arab hopes lay with the Arab Legion of Transjordan's monarch, King Abdullah I. He did not intend to create a Palestinian Arab-run state, as he hoped to annex much of the territory of the British Mandate of Palestine. Playing a double-game, he was in contact with the Jewish authorities as with the Arab League. Preparing for Arab intervention from neighbouring states, Haganah successfully launched Operations Yiftah and Ben-'Ami to secure the Jewish settlements of Galilee, and Operation Kilshon. This created an Israeli-controlled front around Jerusalem. The inconclusive meeting between Golda Meir and Abdullah I, followed by the Kfar Etzion massacre on the 13 May by the Arab Legion, led to predictions that the battle for Jerusalem would be merciless. Palestinian irregulars of the Holy War Army, approaching al-Qastal village near Jerusalem to take it back from Palmach. On 14 May 1948, the day before the expiration of the British Mandate, David Ben-Gurion declared the establishment of a Jewish state in Eretz Israel, to be known as the State of Israel. Both superpower leaders, U.S. President Harry S. Truman (de facto) and the Soviet leader Joseph Stalin, immediately recognized the new state, while the Arab League refused to accept the UN partition plan, proclaimed the right of self-determination for the Arabs across the whole of Palestine, and maintained that the absence of legal authority made it necessary to intervene to protect Arab lives and property. Over the next few days, contingents of four of the seven countries of the Arab League at that time, namely Egypt, Iraq, Transjordan, and Syria, invaded territory in the former British Mandate of Palestine and fought the Israelis. They were supported by the Arab Liberation Army and corps of volunteers from Saudi Arabia, Lebanon and Yemen. The Arab armies launched a simultaneous offensive on all fronts, Egypt forces invaded from south, Jordanian and Iraqi forces invaded from east, while Syrian forces invaded from north. Co-operation among the various Arab armies was poor. The UN declared a truce on 29 May, which began on 11 June and lasted 28 days. The ceasefire was overseen by UN mediator Folke Bernadotte and a team of UN Observers, army officers from Belgium, United States, Sweden and France. Bernadotte was voted in by the General Assembly to "assure the safety of the holy places, to safeguard the well being of the population, and to promote 'a peaceful adjustment of the future situation of Palestine'". Bernadotte spoke of "peace by Christmas" but saw that the Arab world had continued to reject the existence of a Jewish state, whatever its borders. An arms embargo was declared with the intention that neither side would make any gains from the truce. Neither side respected the truce; both found ways around the restrictions. Both the Israelis and the Arabs used this time to improve their positions, a direct violation of the terms of the ceasefire. "The Arabs violated the truce by reinforcing their lines with fresh units (including six companies of Sudanese regulars, Saudi battalion  and contingents from Yemen, Morocco ) and by preventing supplies from reaching isolated Israeli settlements; occasionally, they opened fire along the lines". The Israeli Defense Forces violated the truce by acquiring weapons from Czechoslovakia and improved training of forces and reorganization of the army during this time. Yitzhak Rabin, an IDF commander at the time and later Israel's fifth Prime Minister, said, "[w]ithout the arms from Czechoslovakia... it is very doubtful whether we would have been able to conduct the war". As well as violating the arms and personnel embargo, both sides sent fresh units to the front. The Israel army increased its manpower from approximately 30,000 or 35,000 men to almost 65,000 during the truce. They increased their arms supply to "more than twenty-five thousand rifles, five thousand machine guns, and more than fifty million bullets". Air dropping supplies to besieged Yehiam, 1948. As the truce began, a British officer stationed in Haifa said that the four-week-long truce "would certainly be exploited by the Jews to continue military training and reorganization while the Arabs would waste [them] feuding over the future divisions of the spoils". On 7 July, the day before the expiration of the truce, Egyptian forces under General Muhammad Naguib renewed the war by attacking Negba. Israeli forces launched a simultaneous offensive on all three fronts: Dani, Dekel, and Kedem. The fighting was dominated by large-scale Israeli offensives and a defensive Arab posture. The fighting continued for ten days until the UN Security Council issued the Second Truce on 18 July. Israeli Operation Danny resulted in exodus from Lydda and Ramle of 60,000 Palestinian residents. According to Benny Morris, in Ben-Gurion's view, Ramlah and Lydda constituted a special danger because their proximity might encourage co-operation between the Egyptian army, which had started its attack on Kibbutz Negbah, near Ramlah, and the Arab Legion, which had taken the Lydda police station. Widespread looting took place during these operations. In total, about 100,000 Palestinians became refugees in this stage, according to Morris. In Operation Dekel, Nazareth was captured on 16 July. In Operation Brosh, Israel tried and failed to drive the Syrian army out of north eastern Galilee. By the time the second truce took effect at 19:00 18 July, Israel had taken the lower Galilee from Haifa Bay to the Sea of Galilee. At 19:00 on 18 July, the second truce of the conflict went into effect after intense diplomatic efforts by the UN. On 16 September, a new partition for Palestine was proposed, but it was rejected by both sides. 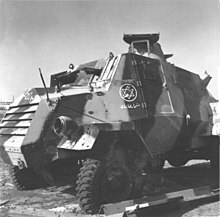 An Otter armored car captured by the Haganah from the ALA in 1948. During the truce, the Egyptians had regularly blocked with fire the passage of supply convoys to the beleaguered northern Negev settlements, contrary to the truce terms. On 15 October, another supply convoy was attacked by the Egyptians, and the already planned Operation Yoav was launched. Its goal was to drive a wedge between the Egyptian forces along the coast and the Beersheba-Hebron-Jerusalem road and to open the road to the encircled Negev settlements. Yoav was headed by the Southern Front commander Yigal Allon. The operation was a success, shattering the Egyptian army ranks and forcing the Egyptian forces to retreat from the northern Negev, Beersheba and Ashdod. Meanwhile, on 19 October, Operation Ha-Har commenced operations in the Jerusalem Corridor. On 22 October, the third truce went into effect. Before dawn on 22 October, in defiance of the UN Security Council cease-fire order, ALA units stormed the IDF hilltop position of Sheikh Abd, overlooking Kibbutz Manara. The kibbutz was now besieged. Ben-Gurion initially rejected Moshe Carmel’s demand to launch a major counteroffensive. He was wary of antagonizing the United Nations so close on the heels of its cease-fire order. During 24–25 October, ALA troops regularly sniped at Manara and at traffic along the main road. In contacts with UN observers, Fawzi al-Qawuqji demanded that Israel evacuate neighboring Kibbutz Yiftah and thin out its forces in Manara. The IDF demanded the ALA's withdrawal from the captured positions and, after a “no” from al-Qawuqji, informed the United Nations that it felt free to do as it pleased. On 24 October, the IDF launched Operation Hiram and captured the entire upper Galilee, originally attributed to the Arab state by the Partition Plan. They drove the ALA back to Lebanon. At the end of the month, Israel had captured the whole Galilee and had advanced 5 miles (8.0 km) into Lebanon to the Litani River. On 22 December, large IDF forces started Operation Horev. Its objective was to encircle the Egyptian Army in the Gaza Strip and force the Egyptians into ending the war. The operation was a decisive Israeli victory, and Israeli raids into the Nitzana area and the Sinai Peninsula forced the Egyptian army into the Gaza Strip, where it was encircled. Israeli forces withdrew from Sinai and Gaza under international pressure and after the British threatened to intervene against Israel. The Egyptian government announced, 6 January 1949, that they were willing to enter armistice negotiations. General Yigal Allon persuaded Ben-Gurion to continue as planned, but Ben-Gurion told him: "Do you know the value of peace talks with Egypt? After all, that is our great dream!" He was sure that Transjordan and the other Arab states would follow suit. On 7 January 1949, a truce was achieved. On 5 March, Israel launched Operation Uvda; by 10 March, the Israelis reached Umm Rashrash (where Eilat was built later) and took it without a battle. The Negev Brigade and Golani Brigade took part in the operation. They raised a hand-made flag ("The Ink Flag") and claimed Umm Rashrash for Israel. Israel after 1949 Armistice Agreements. In 1949, Israel signed separate armistices with Egypt on 24 February, Lebanon on 23 March, Transjordan on 3 April, and Syria on 20 July. The armistice lines saw Israel holding about 78% of mandate Palestine (as it stood after the independence of Transjordan in 1946), 22% more than the UN Partition Plan had allocated. These ceasefire lines were known afterwards as the "Green Line". The Gaza Strip and the West Bank were occupied by Egypt and Transjordan, respectively. The United Nations Truce Supervision Organization and Mixed Armistice Commissions were set up to monitor ceasefires, supervise the armistice agreements, to prevent isolated incidents from escalating, and assist other UN peacekeeping operations in the region. Israel lost 6,373 of its people, about 1% of its population in the war. About 4,000 were soldiers and the rest were civilians. The exact number of Arab losses is unknown but is estimated at between 4,000 for Egypt (2,000), Jordan and Syria (1,000 each) and 15,000. During the 1947–48 Civil War in Mandatory Palestine and the 1948 Arab–Israeli War that followed, around 700,000 Palestinian Arabs fled or were expelled. In 1951, the UN Conciliation Commission for Palestine estimated that the number of Palestinian refugees displaced from Israel was 711,000. This number did not include displaced Palestinians inside Israeli-held territory. The list of villages depopulated during the Arab–Israeli conflict includes more than 400 Arab villages. It also includes about ten Jewish villages and neighbourhoods. The causes of the 1948 Palestinian exodus are a controversial topic among historians. The Palestinian refugee problem and the debate around the right of their return are also major issues of the Israeli–Palestinian conflict. Palestinians have staged annual demonstrations and protests on 15 May of each year. During the 1948 Arab–Israeli War, around 10,000 Jews were forced to evacuate their homes in Palestine or Israel. The war indirectly created a second, major refugee problem, the Jewish exodus from Arab and Muslim lands. Partly because of the war between Jews and Arabs in Palestine, hundreds of thousands of Jews who lived in the Arab states were intimidated into flight, or were expelled from their native countries, most of them reaching Israel. The immediate reasons for the flight were the popular Arab hostility, including pogroms, triggered by the war in Palestine and anti-Jewish governmental measures. In the three years following the war, about 700,000 Jews immigrated to Israel, where they were absorbed, fed and housed mainly along the borders and in former Palestinian lands. Beginning in 1948, and continuing until 1972, an estimated 800,000 to 1,000,000 Jews fled or were expelled. From 1945 until the closure of 1952, more than 250,000 Jewish displaced persons lived in European refugee camps. About 136,000 of them immigrated to Israel. More than 270,000 Jews immigrated from Eastern Europe, mainly Romania and Poland (over 100,000 each). Overall 700,000 Jews settled in Israel, doubling its Jewish population. After the war, Israeli and Arab historiographies have differed on interpretation of the events of 1948. In Western historiography, the majority view was of the vastly outnumbered and ill-equipped Jews fighting off the massed strength of the invading Arab armies; it was also widely believed that the Palestinian Arabs left their homes on the instruction of their leaders. In 1980, with the opening of the Israeli and British archives, Israeli historians started giving new insights into the history of this time period. In particular, the roles played by Abdullah I of Jordan and the British government, the goals of the different Arab nations, the balance of force, and the events related to the Palestinian exodus have been expressed in more complexity or given new interpretations. These insights are the result of historical analysis of "the war as contingent on the flow of battle and voluntary/involuntary movements of threatened populations—rather than on any masterplan or evil intentions that would raise questions about Israel's legitimacy." Some of the issues continue to be hotly debated among historians and commentators of the conflict today. Palestinian and Arab historians have also provided context. However, the work of these historians tend to be apologetic, rely on subjective sources, and designed to project blame for the Arab defeat in the war. Those Palestinian historians since the 1960s who have utilized historical methodologies have not had the same impact on Arab society that the Israeli New Historians did in Israeli society. This is due, in part, to fear that critical analysis of their role in the war might weaken the Palestinian position in the ongoing Israeli–Palestinian conflict. Unlike Israel and Britain, Arab governments have not released relevant primary sources from their archives. ^ Israelis refer to the war as their War of Independence or War of Liberation, because the modern State of Israel originated in the Yishuv (the pre-state Jewish community in Palestine) declaring its independence from the British Mandate in 1948. Palestinians refer to this as al-Nakba ("the Catastrophe"), because of the land they lost, the failure to create a Palestinian Arab State, and the 1948 Palestinian exodus. ^ AFP (24 April 2013). "Bedouin army trackers scale Israel social ladder". Al Arabiya. Retrieved 7 May 2015. ^ a b c d Benny Morris, 1948: A History of the First Arab-Israeli War, Chapter 5. ^ Benny Morris (2008), p.419. ^ Rosemarie Esber, Under the Cover of War, Arabicus Books & Medica, 2009, p.28. ^ Neil Caplan, ‘Perhaps the most famous case of differences over the naming of events is the 1948 war (more accurately, the fighting from December 1947 through January 1949). For Israel it is their “War of Liberation” or “War of Independence” (in Hebrew, milhemet ha-atzama’ut) full of the joys and overtones of deliverance and redemption. For Palestinians, it is Al-Nakba, translated as “The Catastrophe” and including in its scope the destruction of their society and the expulsion and flight of some 700,000 refugees.’ The Israel-Palestine Conflict: Contested Histories, John Wiley & Sons, Sep 19, 2011 p.17. ^ This corresponds to the signing of the armistice agreement between Syria and Israel. Others consider the war to have ended at the last ceasefire on January 8, 1949. ^ Demise of the British Empire in the Middle East: Britain's Responses to Nationalist Movements, 1943-55, by Michael Joseph Cohen, Martin Kolinsky. 1998. p. 54. ^ Yoav Gelber, Israel's War of Independence — the equivalent to the Palestinians' Al- Nakba (Arabic for "Disaster") – consisted of two distinct, consecutive, but separate campaigns fought by different enemies, under dissimilar circumstances, each phase under different rules. The first encounter commenced early in December 1947 and lasted until the British mandate in Palestine expired. It was a civil war between Jews and Palestinians that took place under British sovereignty and in the presence of Jewish troops. The second contest began with the invasion of Palestine by the regular Arab armies on 156 May 1948.’ Palestine, 1948: war, escape and the emergence of the Palestinian Refugee Problem, Sussex Academic Press, 2nd rev ed. 2004 p.4. ^ David Tal, War in Palestine, 1948: Strategy and Diplomacy, Routledge, 2004. ^ Cragg, Kenneth. Palestine: The Prize and Price of Zion. Cassel, 1997. ISBN 978-0-304-70075-2. Pages 57, 116. — Memorandum on the Palestine Refugee Problem, 4 May 1949, FRUS, 1949, p. 984.: "Approximately 700,000 refugees from the Palestine hostilities, now located principally in Arab Palestine, Transjordan, Lebanon and Syria, will require repatriation to Israel or resettlement in the Arab states." ^ a b Displaced Persons retrieved on 29 October 2007 from the U.S. Holocaust Museum. ^ a b Tom Segev, 1949. The First Israelis, Owl Books, 1986, p.96. ^ Morris, 2001, chap. VI. ^ "Jewish Refugees of the Israeli Palestinian Conflict". Mideast Web. Retrieved 2013-04-01. ^ Axelrod, Alan (2014). Idiot's Guides: The Middle East Conflict. Penguin Group. ISBN 9781615646401. ^ a b Benny Morris, Righteous Victims, chap. VI. ^ "A/RES/181(II) of 29 November 1947". domino.un.org. 1947. Archived from the original on 24 May 2012. Retrieved 11 January 2012. ^ UNITED NATIONS CONCILIATION COMMISSION FOR PALESTINE A/AC.25/W/19 30 July 1949 Archived 2 October 2013 at the Wayback Machine,"The Arabs rejected the United Nations Partition Plan so that any comment of theirs did not specifically concern the status of the Arab section of Palestine under partition but rather rejected the scheme in its entirety." ^ Benny Morris (2008). 1948: a history of the first Arab-Israeli war. Yale University Press. p. 67. Retrieved 13 July 2013. p. 67, "The League’s Political Committee met in Sofar, Lebanon, on 16–19 September, and urged the Palestine Arabs to fight partition, which it called “aggression,” “without mercy"'; p. 70, '"On 24 November the head of the Egyptian delegation to the General Assembly, Muhammad Hussein Heykal, said that “the lives of 1,000,000 Jews in Moslem countries would be jeopardized by the establishment of a Jewish state." ^ Benny Morris (2008). 1948: a history of the first Arab-Israeli war. Yale University Press. p. 116. Retrieved 13 July 2013. At the time, Ben-Gurion and the HGS believed that they had initiated a one-shot affair, albeit with the implication of a change of tactics and strategy on the Jerusalem front. In fact, they had set in motion a strategic transformation of Haganah policy. Nahshon heralded a shift from the defensive to the offensive and marked the beginning of the implementation of tochnit dalet (Plan D)—without Ben-Gurion or the HGS ever taking an in principle decision to embark on its implementation. ^ "The First Truce". Jewish Virtual Library. Retrieved 2009-02-22. ^ Morris, Benny (2008). 1948: A History of the First Arab-Israeli War. Yale University Press. ISBN 978-0-300-12696-9. ^ a b c d e Morris, Benny. 1948: A History of the First Arab-Israeli War. ^ Morris, 2004, p. 448. ^ Benny Morris (2008), p.323. ^ Benny Morris (2008). 1948: a history of the first Arab-Israeli war. Yale University Press. p. 339. Retrieved 13 July 2013. Al-Qawuqji supplied the justification for Operation Hiram, in which the IDF overran the north-central Galilee "pocket" and a strip of southern Lebanon... In truth, as with Yoav, Operation Hiram had been long in the planning... on 6 October, at the IDF General Staff meeting, Carmel had pressed for [Hiram] authorization, but the Cabinet held back. The Arabs were shortly to give him his chance. Before dawn on 22 October, in defiance of the UN Security Council cease-fire order, ALA units stormed the IDF hilltop position of Sheikh Abd, just north of, and overlooking, Kibbutz Manara... Manara was imperiled... Ben-Gurion initially rejected Carmel's demand to launch a major counteroffensive. He was chary of antagonizing the United Nations so close on the heels of its cease-fire order. ... The kibbutz was now besieged, and the main south-north road through the Panhandle to Metulla was also under threat. During the 24–25 October ALA troops regularly sniped at Manara and at traffic along the main road. In contacts with UN observers, al-Qawuqji demanded that Israel evacuate neighboring Kibbutz Yiftah... and thin out its forces in Manara. The IDF demanded the ALA's withdrawal from the captured positions and, after a "no" from al-Qawuqji, informed the United Nations that it felt free to do as it pleased. Sensing what was about to happen, the Lebanese army "ordered" al-Qawuqji to withdraw from Israeli territory—but to no avail. Al-Qawuqji's provocation at Sheikh Abd made little military sense... On 16 October, a week before the attack on Sheikh Abd, Carmel ... had pressed Ben-Gurion to be allowed "to begin in the Galilee." Ben-Gurion had refused, but on 24–25 October he gave the green light. ^ Benny Morris (2008), p.369. ^ L. Rogan, Eugene; Shlaim, Avi. "The War for Palestine. Rewriting the History of 1948". Institute of Historical Research. Archived from the original on 2009-08-11. Retrieved 2009-08-08. ^ "Jewish Refugees of the Israeli Palestinian Conflict". Mideast Web. Retrieved 2008-07-13. ^ Benny Morris (1 October 2008). 1948: A History of the First Arab-Israeli War. Yale University Press. p. 412. ISBN 978-0-300-14524-3. The war indirectly created a second, major refugee problem. Partly because of the clash of Jewish and Arab arms in Palestine, some five to six hundred thousand Jews who lived in the Arab world emigrated, were intimidated into flight, or were expelled from their native countries, most of them reaching Israel, with a minority resettling in France, Britain, and the other Western countries. The immediate propellants to flight were the popular Arab hostility, including pogroms, triggered by the war in Palestine and specific governmental measures, amounting to institutionalized discrimination against and oppression of the Jewish minority communities. ^ Malka Hillel Shulewitz, The Forgotten Millions: The Modern Jewish Exodus from Arab Lands, Continuum 2001. ^ Ada Aharoni "The Forced Migration of Jews from Arab Countries Archived 2012-02-13 at the Wayback Machine, Historical Society of Jews from Egypt website. Accessed April 4, 2013. ^ Benny Morris, Righteous Victims, chap.VI. ^ a b Avi Shlaim, "The Debate about 1948", International Journal of Middle East Studies, Vol. 27, No. 3 (Aug., 1995), pp. 287–304. ^ a b Sela, Avraham and Neil Caplan. "Epilogue: Reflections on Post-Oslo Israeli and Palestinian History and Memory of 1948." The War of 1948: Representations of Israeli and Palestinian Memories and Narratives, edited by Sela and Alon Kadish, Indiana University Press, 2016, pp. 203-221. ^ "Israeli Air Force, particularly its scrappy beginnings, inspires 3 films". Jewish Telegraphic Agency. Retrieved 2015-12-10. Saleh Abdel Jawad, The Arab and Palestinian Narratives of the 1948 War, in Robert I. Rotberg, Israeli and Palestinian Narratives of Conflict, Indiana University Press, 2006, ISBN 978-0-253-21857-5. Efraim Karsh, The Arab-Israeli Conflict: The Palestine War 1948, Osprey publishing, 2002. Walid Khalidi (ed. ), All that remains.ISBN 978-0-88728-224-9. Walid Khalidi, Selected Documents on the 1948 Palestine War, Journal of Palestine Studies, 27(3), 79, 1998. Eugene Rogan & Avi Shlaim, The War for Palestine — Rewriting the history of 1948, Cambridge University Press, 2001. David Tal, War in Palestine, 1948. Strategy and Diplomacy, Routledge, 2004.